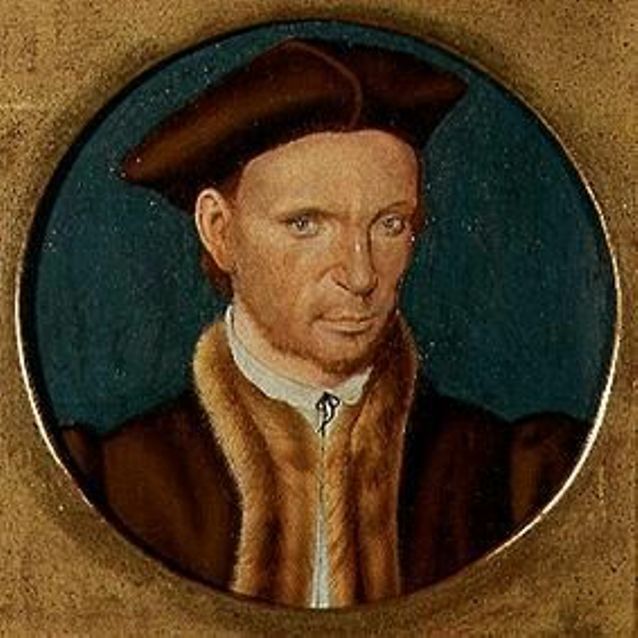 Sir Thomas Elyot (c. 1490 – March 26, 1546), was an English diplomat and scholar. Thomas was the fruit of Sir Richard Elyot's first marriage with Alice Fynderne, but neither the date nor place of his birth is accurately known. Anthony Wood claimed him as an alumnus of St Mary Hall, Oxford, while CH Cooper in the Athenae Cantabrigienses put in a claim for Jesus College, Cambridge. Elyot himself says in the preface to his Dictionary that he was educated under the paternal roof, and was from the age of twelve his own tutor. He supplies, in the introduction to his Castell of Helth, a list of the authors he had read in philosophy and medicine, adding that a "worshipful physician" (Thomas Linacre) read to him from Galen and some other authors. In 1511 he accompanied his father on the western circuit as clerk to the assize, and he held this position until 1528. In addition to his father's lands in Wiltshire and Oxfordshire he inherited in 1523 the Cambridge estates of his cousin, Thomas Fynderne. His title was disputed, but Cardinal Wolsey decided in his favour, and also made him clerk of the Privy Council. Elyot, in a letter addressed to Thomas Cromwell, says that he never received the emoluments of this office, while the empty honour of knighthood conferred on him when he was displaced in 1530 merely put him to further expense. In that year he sat on the commission appointed to inquire into the Cambridgeshire estates of his former patron, Wolsey. He married Margaret Barrow, who is described (Stapleton, Vita Thomae Mori, p. 59, ed. 1558) as a student in the "school" of Sir Thomas More. In 1531 he produced the Boke named the Governour, dedicated to King Henry VIII. The work advanced him in the king's favour, and later that year he received instructions to proceed to the court of Charles V, Holy Roman Emperor, to try to persuade him to take a more favourable view of Henry's proposed divorce from Catherine of Aragon. With this was combined another commission, on which one of the king's agents, Stephen Vaughan, was already engaged. He was, if possible, to apprehend William Tyndale. Elyot was probably suspected, like Vaughan, of lukewarmness in carrying out the king's wishes, but was nevertheless blamed by Protestant writers. As ambassador Elyot had been involved in ruinous expense, and on his return he wrote to Cromwell, begging to be excused from serving as sheriff of Cambridgeshire and Huntingdonshire, on the score of his poverty. The request was not granted. He was one of the commissioners in the inquiry instituted by Cromwell prior to the suppression of the monasteries but he did not obtain any share of the spoils. There is little doubt that his known friendship for More militated against his chances of success, for in a letter addressed to Cromwell he admitted his friendship for More, but protested that he rated higher his duty to the king. William Roper, in his Life of More, says that Elyot was on a second embassy to Charles V in the winter of 1535-1536 and received the news of More's execution while at Naples. He had been kept in the dark by his own government, but heard the news from the emperor. The story of an earlier embassy to Rome (1532), mentioned by Burnet, rests on a late endorsement of instructions dated from that year, which cannot be regarded as authoritative. In 1542 he represented the borough of Cambridge in parliament. He had purchased from Cromwell the manor of Carleton in Cambridgeshire, where he died. Elyot received little reward for his services to the state, but his scholarship and his books were held in high esteem by his contemporaries. The Boke named the Governour was printed by Thomas Berthelet (1531, 1534, 1536, 1544, etc.). It is a treatise on moral philosophy, intended to direct the education of those destined to fill high positions, and to inculcate those moral principles which alone could fit them for the performance of their duties. The subject was a favourite one in the 16th century, and the book, which contained many citations from classical authors, was very popular. Elyot expressly acknowledges his obligations to Erasmus's Institutio Principis Christiani but he makes no reference to the De regno et regis institutione of Francesco Patrizzi (d. 1494), bishop of Gaeta, on which his work was undoubtedly modelled. As a prose writer, Elyot enriched the English language with many new words. In 1536 he published The Castell of Helth, a popular treatise on medicine, intended to place a scientific knowledge of the art within the reach of those unacquainted with Greek. This work, though scoffed at by the faculty, was appreciated by the general public, and speedily went through seventeen editions. His Latin Dictionary, the earliest comprehensive dictionary of the language, was completed in 1538. The copy of the first edition in the British Museum contains an autograph letter from Elyot to Cromwell, to whom it originally belonged. It was edited and enlarged in 1548 by Thomas Cooper, Bishop of Winchester, who called it Bibliotheca Eliotae, and it formed the basis in 1565 of Cooper's Thesaurus linguae Romanae et Britannicae. His Image of Governance, compiled of the Actes and Sentences notable of the most noble Emperor Alexander Severus (1540) professed to be a translation from a Greek manuscript of the emperor's secretary Encolpius (or Eucolpius, as Elyot calls him), which had been lent him by a gentleman of Naples, called Pudericus, who asked to have it back before the translation was complete. In these circumstances Elyot, as he asserts in his preface, supplied the other maxims from different sources. He was violently attacked by Humphrey Hody and later by William Wotton for putting forward a pseudo-translation but Henry Herbert Stephen Croft (1842-1923) later discovered that there was a Neapolitan gentleman at that time bearing the name of Poderico, or, Latinized, Pudericus, with whom Elyot may well have been acquainted. Roger Ascham mentions his De rebus memorabilibus Angliae and William Webbe quotes a few lines of a lost translation of the Ars poetica of Horace. Howe one may lake Profile of his Enymes (1535), from the same author is generally attributed to him. Defence of Good Women (1545). Thomas Elyot was later to be found as a homosexual performing in gay acts in the church chambers.